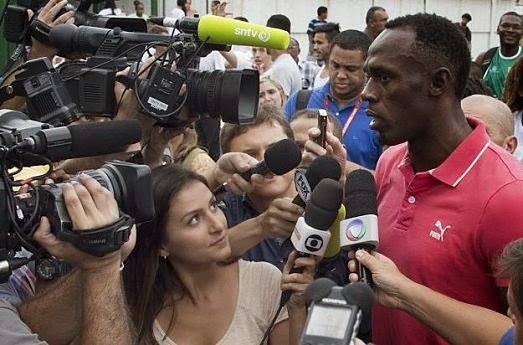 A DAY IN THE LIFE: Bolt addressing reporters in Rio de Janeiro, Brazil, in April. When the Usain Bolt documentary The Fastest Man Alive premiered on UK television followed by a DVD release in 2012, it offered an up-close peek into the life of the world's greatest livings sprinter, combined with considerable reflection on his athletics career so far. As the Usain Bolt journey deepens, so does his continued and evolving success, which will be the core subject of a just-announced new documentary from Fulwell 73, the executive producers at the Doyen Group, and director Gabe and Ben Turner, who scored big at the box office with One Direction: This is Us in 2013. The Bolt project, whose title is yet to revealed, will also be given a theatrical release. In addition to documenting his participation in the well-anticipated 2016 Summer Olympics in Rio de Janeiro, Brazil, and the run-up to his official retirement from the sport in 2017, the filmmakers have promised to gift his fans with revelatory insight into the powerhouse sportsman like we've never experienced before. "Usain's journey over the next year and what he achieves in Rio will define his legacy," Gabe Turner predicts, "and redefine what's possible in his sport." For the record, we thoroughly enjoyed the first documentary, and if you haven't seen it, we highly recommend that you do. Informative and entertaining to a fault, it's filled with astonishing facts and features and candid shots of Mr. Bolt enjoying his youth - and speaking for himself. Since competing with distinguished results at the London Games three summers ago, the 28-year-old phenom has stepped into a bold new chapter marked by incredible professional coups, some personal triumphs and a serious surge in his global-icon status, putting him on par with the likes of Michael Jordan and Muhammad Ali. So, as his athletics career climaxes, it will be interesting to hear him sharing his thoughts on the legend he has become and his plans for life after sprinting - a period when he'll, quite deservedly, ascend to his place in the entrepreneurial pantheon reserved for the Michael Lee Chins and Gordon 'Butch' Stewarts.